Steenbergen Cemetery is located south of Mt. Pulaski in Mt. Pulaski Township, Logan County, Illinois. The cemetery is privately endowed and is not part of the Logan County Cemetery District. The following history of Steenbergen Cemetery was published in the Mt. Pulaski newspaper in the early 1900s and was shared by Dalen and Sandra Shellhammer who facilitated this recording of the cemetery. "In 1830 Preston Pendleton gave an acre for burying ground of that locality. At that date more land was needed, when about three acres was purchased of Mrs. Joseph Ewing. The whole property was incorporated about 1888, being called the Steenbergen Cemetery. In 1873 a small house was erected at a cost of $300, for cemetery uses. Some people believe that there are between 600 and 1000 people buried there. There is yet enough lots to receive at least 150 more people. "The cemetery association has a sinking fund of about $800 from the interest of which they keep up the cemetery. "Abraham Copeland, 87 years; John D. Copeland, 85 years; William Copeland, 84 years; S. M. Copeland, 78 years; Robert Copeland, 65 years;Roland Birks, 82 years; Jeremiah Birks, 70 years (sic); Richard Birks, 75 years; Robert Buckles, 68 years; John Huston, 73 years; George Girtman, 72 years; Landon Keys, 52 years; Chalton C. Conaway, 70 years; Rev. Michael Mann, 75 years; Jacob Mann, 75 years; John Lucas, 65 years; Jesse Lucas, 69 years; Carter Scroggin, 65 years; C.C. Buckles, 58 years; Grant Buckles, 54 years; Uncle Len Scroggin, 82 years; Elisha Freeman, 70 years; ____ Shepherd, 70 years; Benjamin Ditzler, 60 years; Hugh Collins, 80 years; Henry Freeman, 65 years; Nicholas Whitesides, 82 years; Abraham Lucas, 80 years; Henry Griggs, 70 years; William Turley, 72 years. "With all the above old citizens named, are also buried their wives. "The dates may not be exact, but are nearly so, says Mr. John Buckles. "The first person buried in the cemetery was a child by the name of Barney. "The Steenbergen Cemetery is well kept up, being one of the best country burying grounds in Central Illinois." In 1953 Mr. Ira Veail, of Mt. Pulaski, Ill., provided for a very generous gift of the future income from a very fine farm for the upkeep of the Steenbergen Cemetery, and in a few years an attractive and useful chapel was built on the cemetery grounds. Steenbergen is entered from the east side (by the Chapel). There are many sections to this cemetery. We started lettering with the one farthest north (or closest to the tower). It is letter A. The letters go to the left with the bottom sections first, then directly up and to the right. This looks very confusing but if you hold the lettering up when you stand by the Chapel it should all fit into place. Keep in mind also, many of the stones were very, very hard to read. Note: Deviations from actual layout are the fault of the editor. 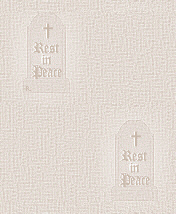 Background graphic provided by Rhio's Sampler. This page is "Steenbergen Cemetery" on the Logan County, Illinois, ILGenWeb site. The address of this page is http://logan.illinoisgenweb.org/Steenbergen.htm.